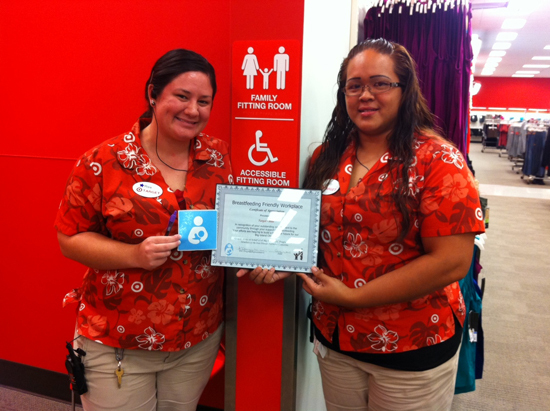 Big Island WIC (Women, Infant and Children) and the East Hawaii Perinatal Consortium recognized businesses for their support of breastfeeding mothers during 2011 World Breastfeeding Week, Aug. 1-7. Local businesses nominated by WIC clients were presented with a certificate for their outstanding commitment to the community through their support of breastfeeding. “On behalf of all Big Island WIC Program staff, I’d like to thank our clients for nominating local businesses and helping other breastfeeding women identify breastfeeding friendly businesses,” Hilo/Kona WIC Program Director Martha Schaffer said. In addition to recognizing local businesses, the East Hawaii Perinatal Consortium delivered gift bags to local obstetricians and pediatricians containing information to encourage breastfeeding early on in pregnancy. The East Hawaii Perinatal Consortium is supported in part by project H67MC04801 from the U.S. Department of Health and Human Services, Health Resources and Services Administration, Maternal and Child Health Bureau (Title V, Social Security Act).